Whenever we go home for a weekend, it’s always a challenge to fit everything in. We need to see both families plus do whatever it is we actually made the trip home for. This time, it was for a Bears game. J’s uncle is a season ticket holder and for the last couple of years, he has offered us a game. Last year, it was against the Lions on Monday night. This year, we originally planned for the Lions game in November, but November is hard for J and I to take time off. A while back, her uncle e-mailed and said he had the Saints game come open and asked if we wanted to go that one instead. Being in October, it was much easier for us to take a relaxing trip home where I could take off Saturday and she could take off Monday. Once I got off work on Friday night, we headed to my parents house about an hour south of Chicago. The plan was to spend the day with them. About a week ago, a friend of mine posted on Facebook that she was going to be mini-photo shoots the weekend we were home. We wanted to take advantage to get Christmas card picture, but we didn’t want to cut time with my family short either. We ended up taking the last time slot for the photo shoot and invited my parents to tag along. It was about a 45 minute drive, but the plan was to go to dinner afterwards before heading to J’s parents for the night. 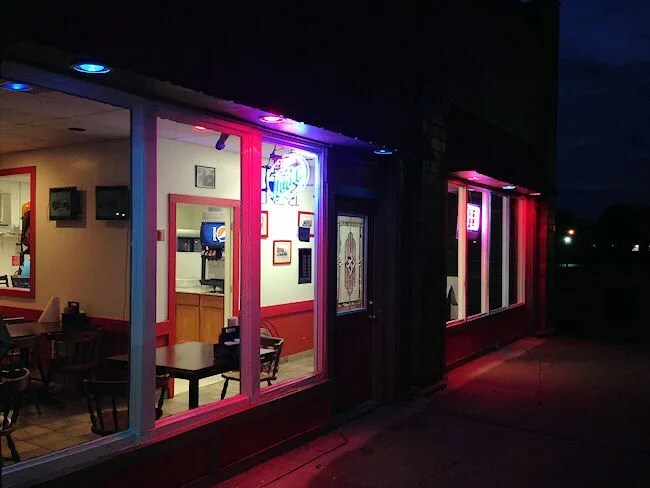 The original plan was pizza, but all three pizza places in the small town of Manhattan, Illinois looked to be carry-out/delivery only. That sort of threw a wrench in our plans, but on the way in town, we noticed a hand written side along Illinois 52 that sounded too good to be true. The Manhattan Firehouse turned in to our back up. 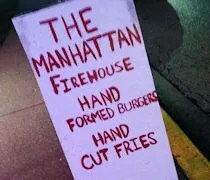 No one had heard of the place before we pulled in to the back parking lot, but the promise of hand formed burgers and hand cut fries was mouthwatering. The small restaurants, which actually used to be a firehouse, has only been open for a few months. It sits right along the busy Illinois 52 on the south side of the small village. The restaurant butts right up to the road, but there is a large gravel parking lot behind the building. The space is divided in to three areas. There’s an order area right when you walk in with the menu written on a giant chalkboard off to the side. There’s also a decent sized dining room. The third space is a bar area that overlooks the kitchen. We noticed they advertised beer..including craft beers…but never saw a beer menu to see what they actually had. The menu is all sandwiches with a couple of soups and some deep fried side items. The hardest thing for me is picking what burger actually sounded the best…because they all sounded so damn good. I went with the creation called The Pote. This 1/2 lb. 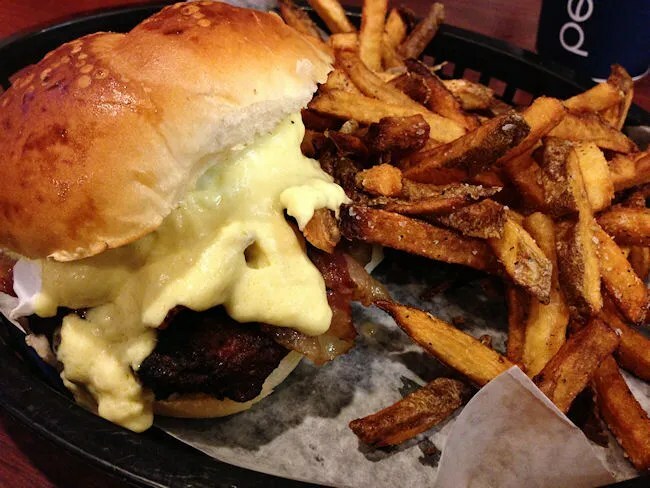 burger is topped with bacon, a poached egg and Hollandaise sauce. The sandwich was pretty amazing. The burger by itself was perfectly grilled and just slightly pink in the middle. The poached egg and Hollandsaise was an interesting topping. The sandwich combined one of my favorite breakfasts with one of my favorite foods. It was a little messy…especially after the egg was breached and it mixed with the sauce, but tackling that mess was totally worth the effort. My mom and J both ordered the BBQ Breast of Chicken Sandwich. 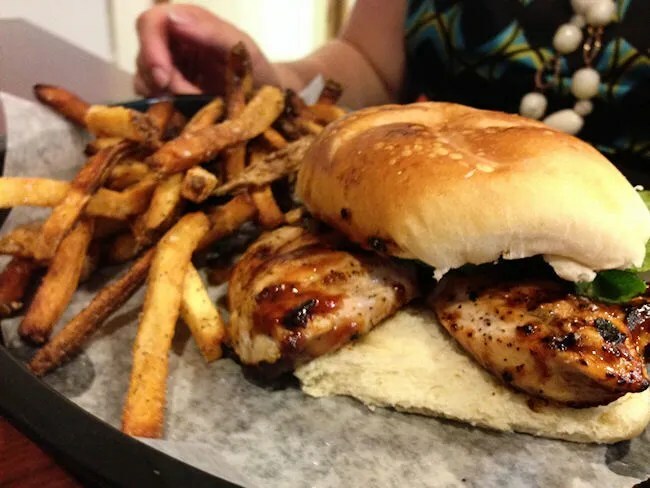 This sandwich was a large, split chicken breast that was covered in a sweet BBQ sauce. Both of them said it was delicious, but also, a little messy. My dad stuck with a 1/2 lb cheeseburger. It was a simple sandwich, but it also let him experience the simple pleasure of a fresh, hand formed hamburger patty. There is a small kids menu and from that, we ordered L the Grilled Cheese. You think it’s a kid’s menu, but the grilled cheese would have been enough for any of us at the table. 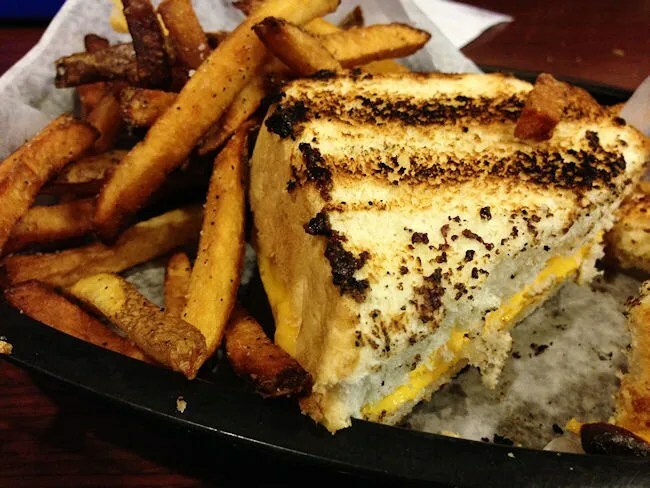 The sandwich is Texas Toast grilled up on the flat top with a couple slices of American cheese. L took a couple bites, but we took most of it home for the next day. All of our sandwiches came with fries. These fries were some of the best any of us had ever had. In fact, it’s odd for my dad to say something is good. It’s even rarer…and odder, for him to offer up the compliment without being asked. The ketchup bottle on our table was almost empty, so my mom reached over to the next table to get another one. He said that he wasn’t even sure these fries needed ketchup…they were so good on their own and everyone agreed with him. The hand cut fries were fried at least twice which left them with a golden brown outside and a soft, chewy middle. There was a perfect dusting of salt on them as well which made for a perfect french fry. The cost, for our meal, with two drinks was around $40 and worth every penny. We lucked in to this place and I’m incredibly happy J talked me in to going back. I was sort of set on pizza because I know that’s what my dad likes, but even he really enjoyed this meal. When you talk about hidden gems in small towns, this place should be on the top of any list.